“Gone With the Wind” may never have been written if author Margaret Mitchell hadn’t suffered an accident that forced her off her feet. Mitchell suffered a serious ankle injury that led to arthritis, which ended her career as a reporter for the Atlanta Journal – as well as her hectic social life. This left the notoriously energetic young woman with considerable free time on her hands. To relieve her boredom, her husband, John Marsh, brought her endless piles of books from Atlanta’s Carnegie Library. Before long, Margaret had read her way through every section save the math and sciences. He suggested she put her talents to good use and write her own book to amuse herself. She set herself up at her tiny desk in the corner of their sitting room and began creating a legendary tale of love, war and survival that would thrill generations of fans. 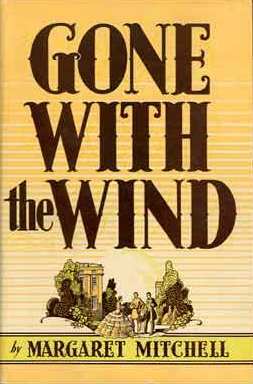 When “Gone With the Wind” was published on June 30, 1936, it sold a million copies in six months and won the Pulitzer Prize in 1937. No-one was more surprised than Mitchell, who was taken aback by her unexpected brush with fame. It’s hard to imagine that a story so sweeping and vast could have been crafted in a space so small and humble. Margaret Mitchell wrote her first and only novel in a tiny two-room apartment in Atlanta just off Peachtree Street. She called it “the dump,” and having grown up just down the road in a mansion it must have felt like one. But she said it with no trace of bitterness, as her life was reportedly a happy one. Mitchell did not have to go out of her way much to research the Civil War period to write her epic novel. She had read about the war from various sources for years and grew up hearing firsthand accounts of life in antebellum Georgia. Margaret poured over letters exchanged between her grandparents as the war waged and read articles written by her father and brother for the Atlanta Historical Bulletin. She wasn’t one for taking notes or using outlines, preferring to work her chapters out in her head and then keeping them separately in manila envelopes. Mitchell wrote the final chapter first, the last few pages of which now hang in the Atlanta History Center. So quite obviously, she always knew Rhett would end up not giving a damn. When Mitchell asked an editor at New York’s MacMillan Publishing named Harold Latham to take a look at her manuscript for “Gone with the Wind,” he loved everything about it –except the main character’s name. Margaret agreed to switch it from Pansy to Scarlett, and one of the most memorable names in literature and motion pictures was born. Although Mitchell didn’t participate in the film adaptation of her book, she did attend the Atlanta film premiere of Gone with the Wind in December 1939. Sadly she died just ten years later at the age of 48 when she was struck by a speeding car crossing Peachtree Street. Many aspects of Gone with the Wind have lost their charm over the years. Much of it is, legitimately, seen as racist, and it’s hard to root for the South as having a moral edge in the Civil War, especially as far as slavery in concerned. But for the legions of fans who call themselves “Windies,” it’s not about such things. For most, it’s about Scarlett’s incredible courage in the face of abject ruin and her ability to adapt to whatever situation she must to survive. When the rest of the Old South is crumbling around her, Scarlett finds a way to not only get by, but to thrive. This message transcends whatever else’s going on in the plot, and makes Scarlett O’Hara a modern American woman to be reckoned with, much like Margaret Mitchell was.